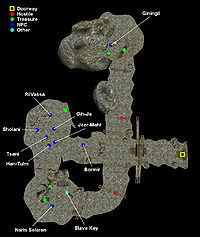 Sha-Adnius is a small slavers cave on the western edge of the Foyada Bani-Dad. 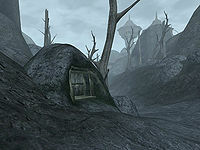 It is located east of Khuul, over some hills and near two Dwemer ruins. Three slavers are guarding six slaves inside. One slaver, Naris Selaren, offers medium-level training for Short Blade, Light Armor, and Sneak if you can manage to speak with him. Aside from the slave key found on the bench near Selaren, what little treasure that can be found here is nearly entirely random.